Who Is Responsible for Puerto Rico’s Debt? There’s evidence some of it is illegal—and activists agree that Washington’s colonial control over the island’s economy helped create the crisis. Hillary Clinton’s decisive victory over Bernie Sanders in the Puerto Rico Democratic primary on Sunday was not surprising. She won for the same reason she enjoys strong support from blacks and Latinos in the States: Previously established political networks that get out the vote, and the loyalty to local leaders and elected officials, translate into her margin of victory. Despite his more progressive policies, Sanders is not strongly enough embedded in this ground-level political discourse. Yet the positions they take on Puerto Rico represent two competing strands in the fight to save the island from Republicans in Congress, who want to impose conservative, pro-business economic growth models, and hedge- and vulture-fund owners, who want to have their way with Puerto Rico’s wealth and people. Clinton reluctantly endorses a debt-restructuring bill that would impose a fiscal-oversight board with colonial powers; Sanders favors emergency action from the Treasury Department in the form of loans and access to Chapter 9 bankruptcy. There is a general consensus for many of the parties involved in the rapidly unfolding drama known as the Puerto Rican debt crisis that July 1 represents the clock striking midnight, the point at which we enter the potential chaos of unbridled bondholder lawsuits and even more draconian government cuts in services to the unincorporated territory inhabited by 3.5 million US citizens. At that point, Puerto Rico is expected to default on an $800 million debt payment of general-obligation bonds, which will spur the owners of that debt—whose payment is given priority over other governmental expenditures by the island’s Constitution—into legal action. This was ostensibly the impetus for the House Committee on Natural Resources to release the final version of the Puerto Rico Oversight, Management and Economic Stability Act, a k a PROMESA, on May 18, a bipartisan effort that drew sharp responses from various interest groups on the right and left. The debt-crisis battle features a dizzying array of combatants: First are the bondholders, who are roughly divided into hedge- and vulture-fund owners mainly invested in what is called COFINA debt, which is secured by a share of the island’s 11.5 percent sales tax; and other hedge fund and mutual-fund owners, who own general obligation (GO) bonds. The latter group, represented by the lobbying efforts of the Koch-brothers-backed America Future Fund, Main Street Bondholders and 60 Plus organizations, supposedly consists of “average” Puerto Rican and US senior-citizen bondholders. But as The New York Times wrote last December, “Puerto Ricans own less than one-fifth of the island’s debt,” and “most of the group’s revenue comes from a few large, anonymous contributors.” Koch-affiliated groups are not happy with the PROMESA bill because it requires restructuring of the GO debt, even though it is backed by Puerto Rican constitutional guarantees, and they have voiced loud displeasure. Even though Senator Bob Menéndez called the PROMESA bill “neocolonial,” several members of the Hispanic caucus endorsed it. Vulture-fund groups, many of whom bought bonds as cheaply as 30 cents on the dollar and which have more to gain by the potential of acquiring government-owned assets as part of a settlement, seem to be happy with the bill. Democrats like Nancy Pelosi strongly backed PROMESA because the bill “achieved a restructuring process that can work,” even with its poison pill of austerity measures that include lowering the minimum wage to $4.25 for workers under 25 (if the governor chooses to enact this provision). Republicans like the sharply conservative Puerto Rico–born Raúl Labrador and Rob Bishop, who shepherded the bill through the House as committee chair, are satisfied, since the bill left out any provision for healthcare parity and satisfied the Republican mantra of shrinking government spending and mandating a business-friendly economic growth plan. But Puerto Rico Governor Alejandro García Padilla, who in April signed on to an emergency moratorium law justifying the island’s default on a $422 million payment due on May 1—along with many mainstream island politicians, activists, labor unions, and community groups—is deeply unhappy about PROMESA’s fiscal-oversight board. The board became a fait accompli in Congress after the failure of repeated attempts by Puerto Rico’s non-voting representative in the House, Resident Commissioner Pedro Pierluisi, to gain support for his debt-restructuring bill after it was attacked as a “bailout” by bondholder lobbyists. The seven-member oversight board—four of whom would be appointed by Republicans, two by Democrats, and one by the president, with only one required to maintain a residence in Puerto Rico—would have so much authority over the island’s fiscal and governmental affairs that it is seen as a throwback to the early days of US colonial rule, when the governor was a US military officer appointed by the president and the legislature was divided into an upper and lower house, with the upper house completely controlled by Washington. Despite some pushback from Representative Luis Gutiérrez and Senator Bob Menéndez, who called the PROMESA bill “neocolonial,” several members of the Congressional Hispanic Caucus have endorsed it. “When measured against the worsening crisis in Puerto Rico, this legislation is necessary,” said Representative Raúl Grijalva, an outspoken immigration-reform activist, like Gutiérrez. So there is a growing sense in the Beltway media echo-chamber that Washington has spoken on the issue, and all Puerto Rico has left is to hope the bill passes to begin an orderly process of debt restructuring, with at least a temporary stay in legal action by bondholders. But all this posturing reflects little or no sense of what Puerto Ricans think or how they may react if the bill is signed into law. The rhetorical flourish on PROMESA is that it will “save” Puerto Rico, but a growing chorus is not convinced, and is challenging the colonial dynamic, as well as the legality of the debt itself. The gathering at 32BJ was a response to the over-emphasis on Congress and to previous attempts to organize the diaspora, including one held in New York just a few weeks before at Hunter College’s Center for Puerto Rican Studies. The Hunter event featured a panel with Antonio Weiss—Treasury Secretary Jack Lew’s point person on the debt crisis—that heavily centered on Diaspo-Rican elected officials like US Representatives Luis Gutiérrez, Nydia Velásquez, and José Serrano, as well as emerging leaders like New York City Council Speaker Melissa Mark-Viverito. Weiss, although perceived by some Democrats as representing Puerto Rico’s interests in fighting for pensioners’ priorities and advocating for Democratic proposals like an earned-income tax credit, was the subject of a Hedge Clippers report last September. That report questioned his impartiality, in view of the fact that Weiss went from a position at Lazard Frères, a firm that had been active in buying Puerto Rican debt, to his job at Treasury—for which he was opposed by Elizabeth Warren in 2014, who was very uncomfortable with Weiss’s mergers and acquisitions background. Weiss, who received a $21.2 million golden parachute from Lazard upon leaving, has an eclectic history as both an investment banker and former publisher of The Paris Review, which suggests that he might be a more liberal thinker. But as Warren argued, the overrepresentation of the Wall Street view is not desirable in domestic economic policymaking. The Debt: Odious… and Illegal? One of the great ironies of the debt crisis is that following its victory over Spain in 1898, the United States successfully argued against responsibility for debts incurred by Spain when Washington was granted possession of Cuba, Puerto Rico, and the Philippines. This was so-called “odious debt,” because it had not been incurred in the interests of the people in those colonies. While in some senses one could argue that the debt taken on by the Puerto Rican government over the past few decades was in the interest of the people, since it kept government operating and provided services, some argue that aspects of it are illegal, and could thus be annulled in court. A government commission that authorized a debit audit found several possible illegalities. Figueroa felt that auditing the debt was key in Vamos4PR’s fight to prevent Washington—heavily lobbied by bondholders—from determining the island’s fate. “We need to have a forensic investigation independently of those who issued the debt, of those who own the debt, of those who are speculating with the debt, to understand the extent to which this debt is chaining the people of Puerto Rico to a future of misery and poverty,” he insisted in his speech at the 32BJ teach-in. Puerto Rico labor leader Roberto Pagán, who participated in the teach-in, agreed. “I haven’t met with treasury or Antonio Weiss. I think that he is wrong, and we are looking for the opportunity to sit down and present our vision, including audit of the debt,” he said in a phone interview with The Nation. Pagán is also the president of a government commission established last July that authorized an audit of the last 45 years of government bond transactions. But the commission has suffered from underfunding, and only began operating in January of this year. On June 1 the commission released what it called a “Pre-audit Survey” of the two most recent debt issues, the spectacular $3.5 billion general-obligation bond sale of 2014, which took place after the bonds were graded as junk by major ratings agencies, and one issued in 2015. The report contained several findings that suggest possible illegalities: Throughout the crisis it has been casually stated that the Puerto Rican government ran into trouble because it borrowed to cover deficits; indeed, has borrowed over $30 billion to do so, and may have been doing it since 1979. But the report points out that the island’s Constitution “explicitly prohibits” budget deficits. 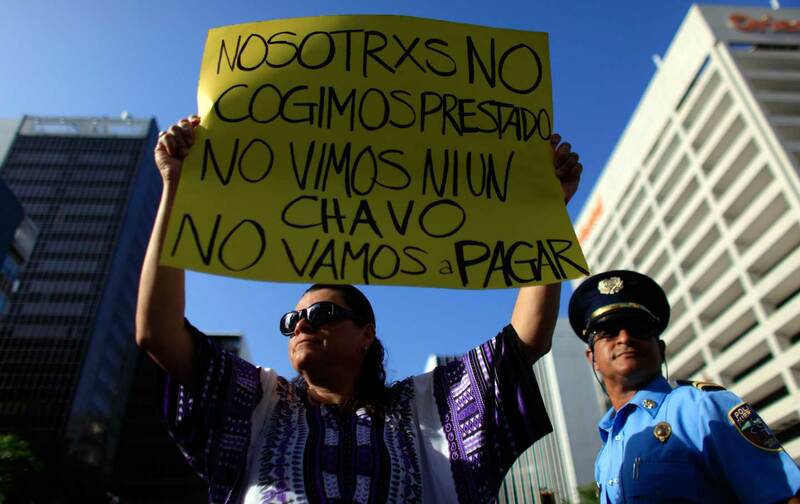 There’s more: The audit commission found that Puerto Rico is spending somewhere between 14 and 25 percent of government revenues on debt repayment—this is significant, because the Constitution prohibits spending more than 15 percent. It also prohibits most bond sales that would mature more than 30 years after their issue, yet the commission found that, because of the terms of the 2014 sale, debt issued in 1987 will not be paid off until 2035, 48 years later. This practice of refinancing mature debt with new debt, called “scoop and toss,” seems to be systematic. The debt-audit strategy—taken up by Argentina and Greece during their debt crises—gained strength last October when Hostos Community College professor and lawyer Nelson Torres-Ríos brought up the 1885 Litchfield v. Ballou case, which held that bonds created in violation of a municipal debt limit do not have to be repaid. In the Detroit bankruptcy proceedings, according to the pre-audit survey, Litchfield, among other cases, was used to show how evasion of the debt limit could invalidate some debt. The Puerto Rican government’s failure to issue financial statements and provide information about the most recent bond sales has led to public pressure for information, as symbolized by the suit by Puerto Rico’s Center for Investigative Journalism demanding details of the $3.5 billion issue in 2014. Despite a ruling in the center’s favor almost a year ago, the Puerto Rico Government Development Bank has not released the information. By June 2, the center, with support from various civil society groups, had helped arrange three public hearings supporting the creation of a transparency law. There are two Supreme Court cases, to be ruled on soon, that may affect the debate. One of them is the appeal to last year’s court ruling that struck down Governor García Padilla’s 2014 Puerto Rico Public Corporations Debt Enforcement and Recovery Act. That bill attempted to set the terms of debt restructuring in the absence of bankruptcy protection for Puerto Rico, which was mysteriously taken away by Congress in 1984. The other is Puerto Rico v. Sánchez Valle. A favorable ruling in Sánchez would acknowledge that Puerto Rico does indeed have the limited autonomy supposedly granted in its 1952 Constitution, which would give the island the right to restructure its own debt. Another possibility available for Puerto Rico is pushing the executive branch to act. This has been done by Representatives Nydia Velázquez and Luis Gutiérrez and Senators Elizabeth Warren and Bernie Sanders; all have brought up the fact that the Federal Reserve can be “creative” by lending money to Puerto Rico to buy back some of its debt and force creditors to sell at a discount. But that would, of course, be perceived as a “bailout,” which is one word that Democrats seem desperate to avoid during an election year, not to mention that it is one of the GOP’s unflagging talking points about “wasteful government spending.” This would also seem to explain the lack of “political will” President Obama seems to have in taking executive action. One very sensitive issue is how resolution of Puerto Rico’s debt crisis will affect the stability of the troubled municipal-bond market; there could be a ripple effect on other distressed municipalities in the United States (New Jersey Governor and Trump booster Chris Christie had been pushing for a fiscal-control board for Atlantic City, but a recent compromise granted the state “broad authority” in monitoring its finances). In remarks to a C-SPAN panel of reporters last month, Rob Bishop made it very clear that PROMESA was designed so as not to set a precedent for any debt problems in the states. Some might hope that this drawn-out drama has been part of a strategy: that Obama has been biding his time this election year. But, as Antonio Weiss says, we’re running out of time. The July 1 default could trigger a cycle of hospital closures, electric-grid instability, infrastructural collapse, and emergency-service breakdowns. In addition, the government pension fund is $43.2 billion in debt. Even under PROMESA, public-sector pensions won’t be protected, which means they could be severely cut. This would trigger a crisis among the island’s increasingly elderly population, much of which was employed by the government. The debt crisis has certainly allowed presidential candidate Bernie Sanders to further distinguish himself from Hillary Clinton. In a statement issued last month, the Vermont senator denounced PROMESA’s proposed control board as an ugly manifestation of Puerto Rico’s colonial reality. He has since proposed legislation that would allow the Federal Reserve to grant Puerto Rico loans and bankruptcy protection. Hillary Clinton has merely expressed concern about the powers of the fiscal-oversight board and the threat to the island’s minimum wage; she says “we must move forward on the legislation,” because there is seemingly no other option than the House bill to alleviate Puerto Rican suffering. It’s unclear whether Clinton’s position is related to the fact that some vulture- and hedge-fund operators have been major contributors to her campaign. They include Marc Lasry, who as late as last November was continuing to buy up Puerto Rico bonds. Two weeks ago, she lost the support of the progressive Mayor of San Juan, Carmen Yulín Cruz, and LGBT activist Pedro Julio Serrano. In withdrawing their endorsement, both cited Clinton’s lack of opposition to the oversight board. She did, however just win the endorsement of Governor García Padilla. What progressives in the United States and Puerto Rico agree on is that pressure must be put on Washington to own up to its responsibility in the debt crisis. Washington’s colonial control over the country’s economy helped create this situation; UCLA professor César Ayala says that Puerto Rico would rank next to last on a list of world countries in GNP-to-GDP ratio. Only $67 billion out of the island’s $100 billion in earnings stays in Puerto Rico. Ayala estimates that between 2004 and 2013, US multinationals repatriated $313 billion from Puerto Rico, which is enough to repay the debt fourfold. While everyone agrees there is a shared responsibility for the crisis, and that a series of elected Puerto Rican governments played a role in continuing to amass debt, it can also be argued that they had no choice and were acting much like many US state governments and municipalities in recent years. Such an obvious failure should not be a reason for Puerto Ricans on the island or on the mainland to accept the odious imposition of PROMESA’s fiscal-oversight board. Of course, even if the bill passes the House, it could be softened in the Senate. But for now, there is a growing consensus, among mainstream politicians and grassroots activists here and on the island, that it must be rejected, and that Congress is gravely mistaken if it thinks this will save Puerto Rico.